To kill, and then burn a human being, are not new in our country. To brutally murder and then gloat about it is also not new. But today you can gloat about it on camera and make sure it goes viral on social media creating a horrific voyeuristic experience of violence for those who want to watch. This is the new normal, in a country where creating fear of the other is constantly being taken to new heights. In the Bombay riots 25 years ago after the demolition of the Babri Masjid on December 6 1992, mob lynching, and burning dead bodies so that no evidence remained, was witnessed in many parts of the city. 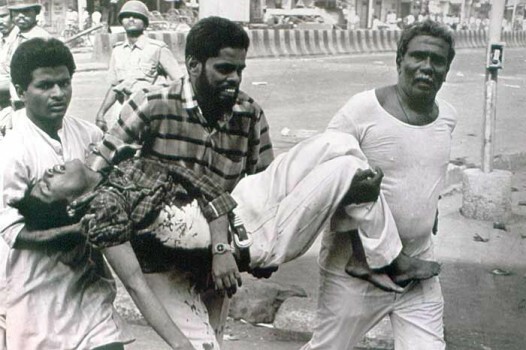 Even before that, in the anti-Sikh pogrom in New Delhi, many were victims of insensate mob fury. Justice has been denied everywhere. Officially, 900 people were killed in the Bombay riots, including 575 Muslims and 275 Hindus. In the communal violence in Bombay city in 1992-93, the police would not even register a case of murder and often the so-called missing cases would be recorded as missing, believed killed. Families are running around for justice even now. Cases of missing persons were left to the ingenuity of two intrepid NGOs and two individuals who investigated on their own with the help of a small team, which had the government mandate to file panchnamas and do the sleuthing that should have been done by the police. While 225 cases of missing persons were recorded in the riots by 1995-96, thanks to the efforts of Pappubhai Qureshi of Citizens for Peace and Mariam Rashid of the Society for Human and Environmental Development (SHED), and compensation of Rs two lakh was awarded to their families in most cases, there was no question of punishing the guilty. Eyewitnesses to the killing and burning of Hindus and Muslims during the riots opened up to Qureshi and his team and narrated how murders took place before their eyes. These were things they would never tell the police. Over two decades after the bloodiest riots the city had witnessed in a century sporadically punctured by communal clashes, there is no sense of closure or justice for the survivors. The city has moved on scarred, nursing its wounds and the hundreds of people whose lives changed forever live, haunted by painful memories. For some, it’s a closed chapter but the fact of the demolition of the Babri Masjid and the loss of their loved ones will remain. The riots were capped by the city's first serial bomb blasts on March 12, 1993, in a way eclipsing the carnage in the past two months. About 257 people were killed and 713 injured in the 12 serial blasts which paralysed the city, which had barely recovered from a prolonged bout of violence. The state responded with an alacrity not seen in the riots, the police swung to investigate and arrest suspects, while the main perpetrators quietly left the country. A designated court under the Terrorist and Disruptive Activities (prevention) act, since repealed, was constituted to deal only with the blasts cases in the high security Arthur road jail in central Mumbai and the long high profile trial ended in a 100 convictions, and at least 20 death sentences. For the riots, the then Prime minister P V Narasimha Rao did institute an inquiry commission in 1993 headed by the meticulous Justice B N Srikrishna who submitted a voluminous report in 1998 after many ups and downs. His report was rejected by the then BJP-Shiv Sena state government which had earlier stopped the commission's work when it came to power in Maharashtra in 1995 since it was “taking too long and its report would reopen old wounds.” It took the intervention of Prime minister Atal Bihari Vajpayee to restart its work in 1996. The commission was then told to also investigate the blasts and probe the circumstances and causes leading upto it. The commission clearly indicted 31 policemen for their role during the riots, of who ten were punished, 11 were found not guilty and one died. The commission had also named some political leaders as responsible for the violence especially in the January 1993 phase of the riots. The leader of the Shiv Sena the late Bal Thackeray was named in the report and the police had, even before the riots registered cases against him for hate speech . He was never held responsible like so many others, though former Sena M P Madhukar Sarpotdar was held guilty of hate speech in 2008 and sentenced to a year's punishment and a fine of Rs 5000. Of the 2267 cases registered during the riots, 1371 were closed as true but undetected. A special task force reinvestigated 112 of the closed cases, of which in eight cases fresh charge sheets were filed. In 2007, after public pressure that the blasts cases had achieved some measure of justice while the riots cases had not, the state government agreed to send 16 cases to special courts to expedite them apart from creating four other courts to try 253 pending cases. Of the 894 chargesheets, the accused were acquitted in 539 cases. However, the government decided on further action in 50 cases, after reviewing 379 of these cases. Some were convicted in this process but many cases continue to languish. Two petitions in the Supreme Court for justice for riot victims are still pending; one of them was demanding action against the 31 policemen indicted in the Srikrishna commission report. Truth had already become post-truth even then, and the popular spin added to the hazy memories which often put the blasts before the riots, And people believed what they wanted so much to believe, that the blasts were engineered by Muslims, and so were the riots. Few took the trouble to understand the process and build up to creating a tense atmosphere that preceded the demolition of the mosque or even acknowledge that the riots preceded the blasts. And ten years later the gruesome violence in Gujarat post the horrific train burning at Godhra, once again served to obliterate the memory of the riots in Bombay. And now, with the vigilante squads of gau rakshaks and mob lynchings, there is a renewed and all pervading sense of fear. Muslims now fear travelling or even eating kebabs, as some said, especially while travelling by train. The license to kill and gloat about it on camera has sent a chill everywhere. Impunity is the norm for such barbaric violence, and it has become institutionalised since long. The Bombay riots were one more step in that nefarious history of deliberately showing a community its place as not even second class citizens. The alienation is complete. The horrors continue unchecked. Meena Menon is an independent journalist and former deputy editor of The Hindu. She has been a journalist since 1984, starting out in Bombay Magazine and has worked for the United News of India, Mid-Day, the Times of India and The Hindu. She was the chief of bureau of The Hindu, Mumbai, before being posted to Islamabad from August 2013 till May 2014, when she was expelled, and was later based in New Delhi as environment correspondent till March 2015. She is the author of Riots and After in Mumbai, Organic Cotton: Reinventing the Wheel, Reporting Pakistan and co-author of The Unseen Worker: On the Trail of the Girl Child, and A Frayed History: The Journey of Cotton in India.